Seems like I always have to work harder during the Winter months here in New England to capture my ideal scenic compositions as most of the trees are without leaves and days can be quite dreary. This past weekend my home state of Connecticut and other surroundings states were coated with a fresh layer of snow which made me bundle up to head out in these frigid temps to capture some images. First stop was getting up to the often photographed Old Stone Church in West Boylston, MA in time to setup for sunrise and that early morning light alongside my friend & fellow CT photographer Patrick. Throughout the year there is a large American flag on the church and during the month of December it is replaced with a huge wreath for the holidays. 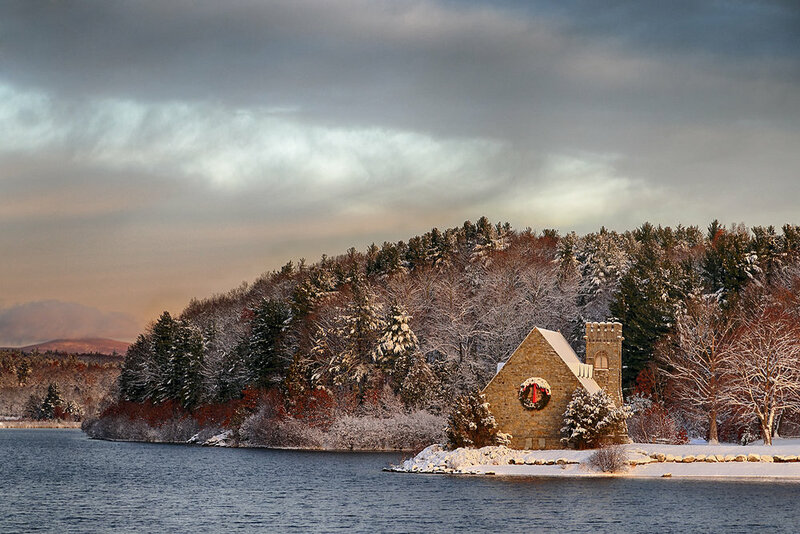 I shot more scenic compositions of the church at first with the surrounding Wachusett Reservoir and then got tighter in on just the church as the light was changing. Cruising around the area for other scenics we came across this park where a number of people were strapping on cross country skis to enjoy the fresh snowfall and walked around a bit. Loved capturing the patterns in the snow before it had been trekked over by the people exploring the area, especially shots including the bright blue sky above to contrast with the snow. Continuing the exploration up that way the next stop was Moore State Park in Paxton, MA, on the advice of another photographer that stopped by the church to shoot as well. Always important to constantly be networking while you’re out in the field to find out about local spots when you adventure to new places. 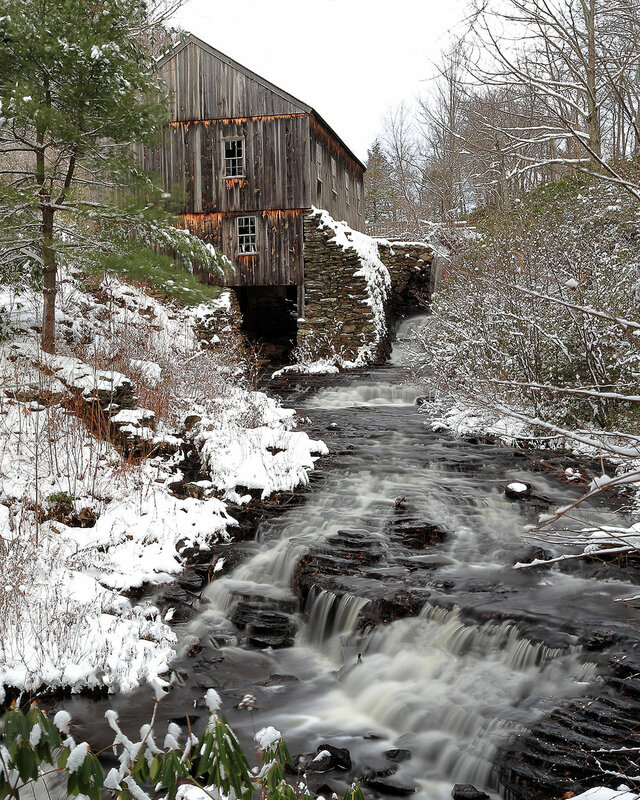 The highlight from Moore State Park was capturing this old grist mill and flowing river below it in a beautiful winter scene. Making our way back down into Northeastern Connecticut in the afternoon we drove around looking for some barns and anything else that caught our eyes to shoot. Just as the sun was started to make it’s way towards the horizon we kept making circles in this one area to try and find the perfect subject to photograph. 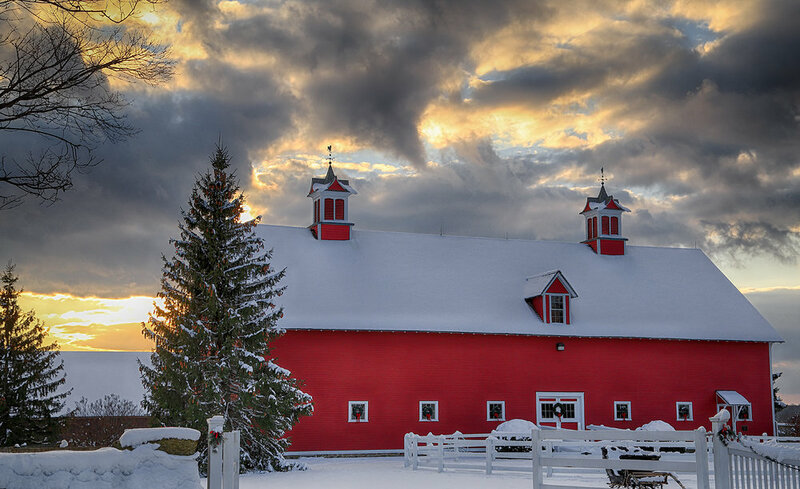 Settling on this classic red barn I found just enough space to pull into so that we could hop out and fire away. Was a super productive day overall that yielded some great keeper shots! Wanting to continue the Winter exploration after a successful Saturday shooting I met up with Patrick again to capture some frozen waterfalls in our home state. Started off at one of the most photographed falls in the state Wadsworth Falls in Middlefield and found it close to 3/4 frozen. Was wild to see a waterfall of this size in this condition! Ended up flying my drone over the falls to get some pretty wild shots and even had some snow flurries come down during the flight. We then headed up to Dividend Pond in Rocky Hill which features a beautiful waterfall that was flowing well despite the crazy low temps. it was my first time checking out this area and Mother Nature delivered in a big way with these Winter vibes. Patrick had to head out in the afternoon so I made my way to Devil’s Hopyard State Park in East Haddam to see what the conditions were like there. Met up with my buddy James and we captured some icy blue tones of the partially frozen Chapman Falls there in the park. Love visiting some of these more popular parks in Winter because it’s so quiet & peaceful compared to the normally business in the warmer months. After exploring a bit we decided to head to Newport, Rhode Island to finish off the day at the Goat Island Lighthouse. They decorate the lighthouse and surrounding fence with Christmas lights and red bows during the holidays. Although my fingertips were pretty much frozen off at this point in the day I had to keep snapping away at this great scene. Was a nonstop weekend of driving all over Southern New England in freezing cold temperatures and I couldn’t have been any happier!